This article will talk about the solution for boot partition resizing on RAID 5 on Windows Server by using partition software. Download IM-Magic Partition Resizer Server to extend boot partition when it is running out of disk space on RAID 5 array. Are you trying to extend boot partition on RAID 5? How to resize boot partition on RAID 5 without rebuilding the array? You can use IM-Magic Partition Resizer Server, which is professional partition software. You can use this software to extend boot partition without affecting the performance of your PC. This partition software can work on Windows Server such as Windows Server 2003, 2008, 2012, Windows SBS 2003/2008, Windows Server 2003 R2, Windows 2008 R2, Windows 2012 R2, etc to resize boot partition. You need to move the unallocated space close to the boot partition. Then, right click boot partition and choose "Resize/Move" option. Move the arrows to add the unallocated space to the boot partition and then click "Apply" button. "I want to extend boot partition on RAID 5 array on my PC runs Windows Server 2008 operating system. The RAID 5 array is created by 3 hard disks. And the array has three partitions which are C drive, D drive and E drive. The C drive only has 2GB free space, while E drive still has more than 40GB available space. I am trying to move some free space from E drive to C drive, but failed. Can you tell me how to resize the C drive on RAID 5 on Windows Server 2008?" "I am trying to resize boot partition on RAID 5 on Windows Server 2003, but I don't find a solution. There are three logical drives on RAID 5 array, but all of them have little free space. I tried to add a new disk to the array, but the new disk is showing as unallocated volume. I cannot move the unallocated volume to the boot partition. Is there any way to extend the boot partition?" In order to extend boot partition on RAID 5, you can rely on partition software. 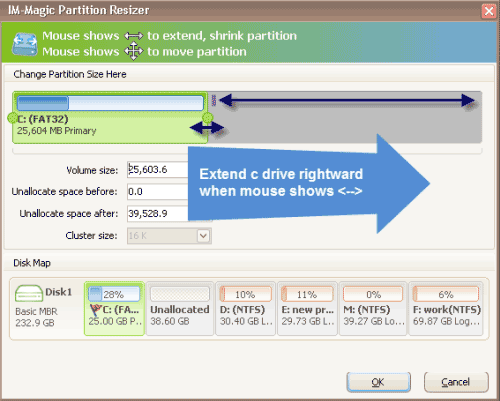 IM-Magic Partition Resizer Server enables you to extend boot partition on Windows Server RAID 5. Whether there is free space on other partitions on the RAID 5 or not, you can use this free partition manager software for Windows Server to extend boot partition without rebuilding array. This partition software will not touch any data stored on the array or causing any hurt to your operating system during partition resizing. C drive is running on low disk space on Windows Server 2003 RAID 5? 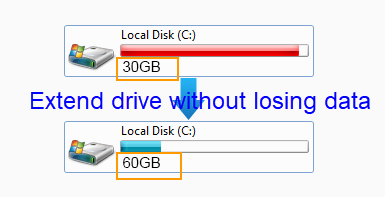 When receiving low disk space warning message on C drive (boot partition) on RAID 5 array, you can check if there is free space on other partitions on the same array. If there is free space on the partitions, you can run the partition software to squeeze some unallocated space from any of partitions and add the unallocated space to C drive. You can resize C drive without reinstalling system or rebuilding array. You even do not need to backup or move any data from the array. Can you still resize boot partition on RAID 5 if there is not enough free space on the array? Do you need to backup data and rebuild array to reallocate free space to boot partition in order to fix the low disk space problem? Well, if there is insufficient space on the RAID 5 array, you can also add new disk to the array. The new added disk will show as unallocated space. You just need to run the partition software and move the arrows to add the unallocated space to boot partition. Please remember not to break the array before partition resizing.